Please take ther opportunity to tell us what you need, share a fantastic tea party you hosted, describe your absolute best tea house experience. Let others know where to stop in their travels for the best tea. BTW Thanks for inviting me to your inbox and I hope you will share your thoughts and experiences with us. Looking for a birthday tea party idea? If your daughter is a fan of the An American Girl dolls and book series you have a great idea for a birthday tea party. There are so many tea party ideas and themes with this series. An American Girl is very popular among the young girls of today. There are historical characters, as well as todays modern girl series. You can have a theme based on one of the characters and their doll from the era they lived in. The characters and their dolls will allow the young ladies to get creative and have fun and learn about another time. It can be an opportunity for them to spend an afternoon in another time period. You will find lots of ideas to make an American Girl tea party special on our web site. If you decide to host an American Girl party let us know what your party was like. Send pictures, we love to share tea party ideas with our readers. Have you experienced the aromatic and flavorful fennel tea? As herbal tea remedies, fennel tea not only tastes good, but has many health benefits as well. Fennel (Latin name: Foeniculum vulgare) is as pleasing to the eye as it is to the nose and palate. It is perennial plant that has thick stout stems that grow 4 to 5 feet or more in height. These bright green plants stand erect and are cylindrical and appear to be smooth as if they had been polished. They grow bright golden flowers and produce large flat terminal umbels, with thirteen to twenty rays. Its leaves are green and feathery. The entire plant of this aromatic herb has a characteristic licorice fragrance and flavor. Fennel blooms in July and August. Read about health benefits of fennel tea here. I hope you will share with me and my readers on the herbs you love to grow and how and why you use that herb. If you have anything to share, you can do it here. This is on of my favorite tea brewing accessories. It is made of cast iron that helps to keep my tea hot. It has a special place on my kitchen island because it is beautiful enough to display all the time. I especially like that it comes with a tea basket inside. The tea I'm brewing can be properly timed and then the basket is easily removed. 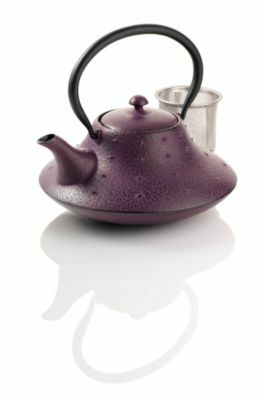 This will be the perfect pot to serve my Easter tea. Speaking of Easter we here at your Cup of Tea wish you a blessed day.